Core Aeration involves perforating the soil with small holes to allow air, water and nutrients to better reach the root system. This helps the roots grow deeply and produces a stronger, more vigorous lawn. 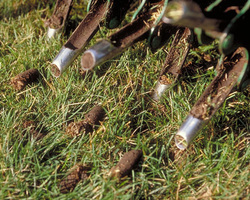 The best time for aeration is during the spring or fall when the cooler temperatures with increased precipitation allows for larger core plugs to be pulled from the ground . Feel free to call us and we will be happy to offer any suggestions or a free lawn consultation to make sure your money invested is being spent most effectively. We go over your entire lawn area with a commercial aerator pulling out core plugs of grass and soil . We even have hand aerators for those hard to reach spots. We then leave the plugs on the lawn which will decompose .